Take a walk through the jungle when you browse these exotic animal packaging supplies. 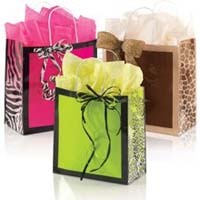 With our animal print shopping bags you'll be giving your customers top quality bags. Black and white has been in style for a long time. Consider white dots on market trays, wrapping paper and tissue paper. Love Damask? 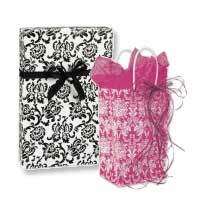 Lots of designs in black and white damask. Black and lime green go well together in packaging designs. We consider it a popular theme for retail businesses. The lime green just really adds life to packaging! 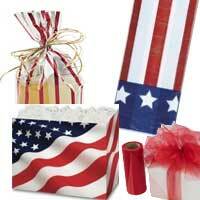 Celebrate the 4th of July with attractive gift packaging in USA colors of red, white and blue. 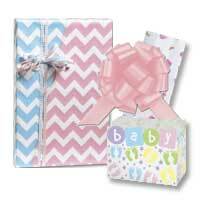 Browse our line of cute baby shower gift wrapping paper, gift baskets, and more. All just perfect for your next baby shower. We have a wide selection of everyday gift wrapping paper that can be used for birthday gifts or just any special occasion. You see the Chevron design everywhere these days. Now you can see it on your favorite gift packaging products. 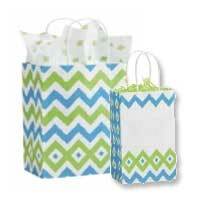 Check out our popular chevron tissue paper too! 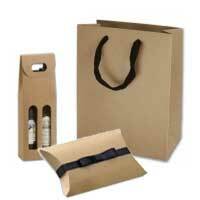 The natural beauty of Kraft gift boxes and shoppers is evident. Add your company logo to your gift boxes and watch your advertising take off. 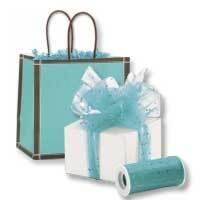 Wrap your gifts with coordinating turquoise packaging. 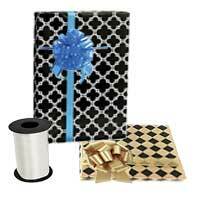 From ribbon to paper shoppers and tissue paper, you'll find all the gift packaging items you need at BowsNBags. 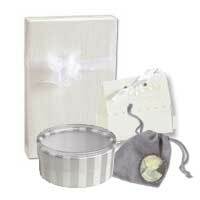 Find all your wedding event party favors, wrapping paper and personalized labels at wholesale pricing. 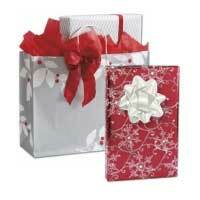 Christmas gift bags, gift boxes, wrapping paper and ribbon are high quality gift packaging supplies. Enjoy 15% off your orders! 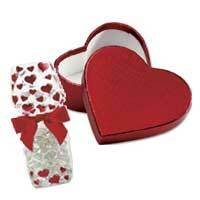 Stock up with sweet treat valentines food boxes. FDA approved.